This English thrash band was formed in 1987 in Warwick. The band appeared on the Taste Of Armageddon sampler and released two albums before disbanding. The quintet of Martin, Jeaves, Ingram, Henderson and Barrows recorded Balance Of Power. Ingram, Henderson and Barrows quit in late 1992. New Zealander Lawrence Paterson and Grant Edwards - a fan of the band - were soon recruited and the band continued as a quartet. Edwards joined the band too late to play on Darkened Reality. As such, the bass duties on the sophomore effort were split between Jeaves and Ingrams. Paterson had relocated to the UK in order to get into the metal scene and to see Iron Maiden live at the Hammersmith Odeon! Once in England he joined a band called The Warning before hooking up with Arbitrater. Arbitrater supported Bolt Thrower and Xentrix in its time. 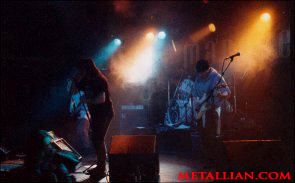 The thrashers also did a small tour called 'Commercial Suicide' with Perception, that ended with a gig at the Marquee in London. Once broken up, two of the members went on to play in Chimera. Paterson later ended up working for Black Sabbath and Cozy Powell. The band featured Sacrilege and Cerebral Fix drummer Andy Barker in the late '80s. Paterson formed Metalhead in 2003.